One hundred years ago, the world celebrated the opening of the Panama Canal. It was a miracle. Where a mountain once stood was now a path of water connecting the world’s two largest oceans. But creating a miracle is no easy task. For only a few coins a day, teenagers Mateo and Henry endure homesickness, backbreaking labour, ferocious heat, landslides, and disease to dig through the mountain with little more than a shovel. Thousands around them lose their lives, while displaced souls like local herb girl Anita, and the endangered rainforest itself, do what they can to survive. This novel in verse tells the story of one of the largest and most difficult engineering projects ever undertaken. It was set to be the Eighth Wonder of the World, the Panama Canal. In 1906, fourteen year old Cuban born Mateo escaped home for a better life. A life where his veteran father can't physically abuse him and he'll do anything to survive. The new project is asking for workers, luring them in with the promise of silver coin payments. No Cubans, no Islanders, just Spanish and Europeans are welcomed. Posing as a Spaniard, he is given the opportunity to work and the promise of a comfortable home, but the work is slave labor and accommodations consist of an empty box car where disgruntled workers talk of a revolution against the American men who demand more of them each day. The workers are colour coded by country and given their role based on the colour of their skin. The Americans, French and Dutch are paid in gold, have beds to sleep in and comfort. The Spaniards, Greeks and Italians are paid in silver and spend each day digging the Canal through thick mud and torturous conditions. While the Jamaicans, Barbadians and Haitians risk their lives by being forced to work deep in the Canal, where landslides continue to kill their fellow countrymen. Jamaican born Henry wanted to create a better life for his mother and siblings, but the lack of food, lack of shelter and dangerous working conditions aren't worth the half pay they receive. Mateo dreams of escaping with the local Herb Girl Anita, who floats through the distressed and disappearing jungle to sell her wares, while Henry wants nothing more than fair treatment and justice. Construction is killing the lush Forrest, the animals are fretting for their homes and workers continue to push through for the fear of being captured and punished for escaping. It may be one of the largest engineering marvels the world has ever created, but for those working on the enormous project, it'll be remembered for all the wrong reasons. Margarita Engle could only be considered a poet, her immaculate use the simplest of words have a incredible impact on the reader. Told from several points of view, the two main characters of Mateo and Henry represent how each class is treated differently, and more severe than the last, while local girl Anita watches her beloved forest being bulldozed and destroyed. Silver People was incredible. 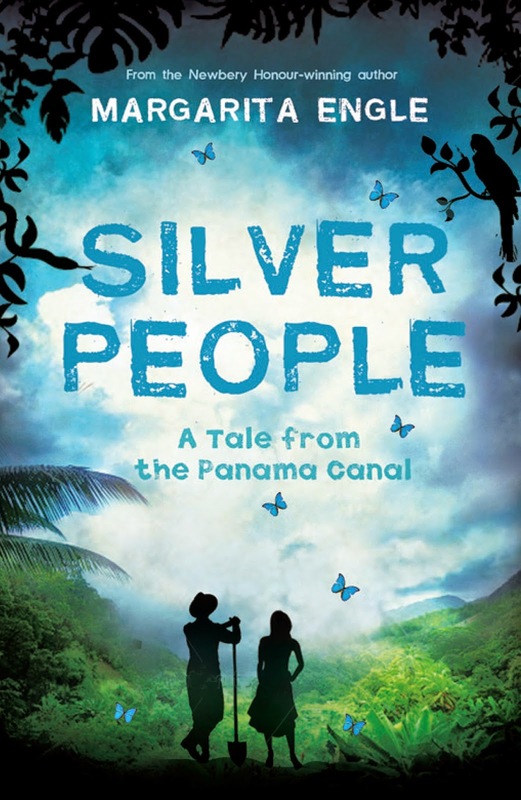 A fictional story behind those who created the Panama Canal, it's told in verse giving the points of view workers, engineers, presidents, locals and forestry animals a powerful and poignant voice. This is just another example how I've fallen in love with the University of Queensland Press. They never fail to publish incredible novels with strong social and environmental messages that have the ability to incite change, emotions and the way we view the world. They are truly the environmental publisher of the young adult generation. I loved the journey that Margarita Engle weaved and it's cemented my love of versed novels even further. Hmm, I haven't heard of this one before but it does sound like a beautiful novel. It was just so beautifully simplistic, it even shares a point of view from the animals and trees that are being decimated. It's super short though, easily read well within less than two hours. It's not my usual read either, but after reading The Simple Gift by Steven Herrick, I've fallen in love with young adult verse novels. Who would have thought a book with so few words could have such an impact. Hey Jules, thanks for stopping by. I actually haven't read Life of Pi, I haven't seen the movie yet either. Now I'm really intrigued and might grab a copy to check out. Like Cait, it's not my kinda read either, but I'm glad you loved it! Every time we find a book that encourages us to think about things beyond ourselves, I feel like we should celebrate that. Such books are far and few between and the heavens know how much we need such messages to be viewed by the newer and developing generations. I'm really enjoying the quirky and unique reads in the last few months, but loving those written in verse. So much so, I'm going to hunt down as many as I can. This one really brings to light how logging and allowing mass man made projects are destroying our world. I loved that is was able to deliver a social message, without coming across as preaching. It was brilliant Faye.